کمالی, عفت سادات, طاهریون, مسعود, عظیمی, علی اکبر, نظیف, سارا. (1393). کاربرد روش ارزیابی همگذاشت فازی در انتخاب گزینه مناسب آبگیری از لجن تصفیه‌خانه شهرک قدس تهران. مجله آب و فاضلاب, 26(1), 68-77. عفت سادات کمالی; مسعود طاهریون; علی اکبر عظیمی; سارا نظیف. "کاربرد روش ارزیابی همگذاشت فازی در انتخاب گزینه مناسب آبگیری از لجن تصفیه‌خانه شهرک قدس تهران". مجله آب و فاضلاب, 26, 1, 1393, 68-77. کمالی, عفت سادات, طاهریون, مسعود, عظیمی, علی اکبر, نظیف, سارا. (1393). 'کاربرد روش ارزیابی همگذاشت فازی در انتخاب گزینه مناسب آبگیری از لجن تصفیه‌خانه شهرک قدس تهران', مجله آب و فاضلاب, 26(1), pp. 68-77. کمالی, عفت سادات, طاهریون, مسعود, عظیمی, علی اکبر, نظیف, سارا. کاربرد روش ارزیابی همگذاشت فازی در انتخاب گزینه مناسب آبگیری از لجن تصفیه‌خانه شهرک قدس تهران. مجله آب و فاضلاب, 1393; 26(1): 68-77. برای طراحی و ارتقای مؤثر سیستم‌های تصفیه فاضلاب و لجن، انتخاب سیستم مناسب از میان گزینه‌های موجود اهمیت زیادی دارد. این مسئله با توجه به توسعه تکنولوژی و افزایش تنوع گزینه‌ها با قابلیت‌های مختلف، در حال حاضر اهمیت ویژه‌ای یافته است. روش‌های تصمیم‌گیری چندمعیاره، یکی از روش‌های رو به توسعه‌ای است که با در نظر گرفتن کلیه معیارهای مؤثر در تصمیم‌گیری، اقدام به تعیین گزینه برتر می‌نماید. قرار‌گیری تصفیه‌خانه فاضلاب شهرک قدس در غرب تهران در مجاورت نواحی مسکونی و نارضایتی شهروندان به‌دلیل بوی منتشره از بسترهای ماسه‌‌ای آبگیری لجن، جایگزینی سیستم آبگیری لجن این تصفیه‌خانه را اجتناب ناپذیر نموده است. به‌منظور تعیین روش مناسب برای سیستم آبگیری لجن این تصفیه‌خانه از تصمیم‌گیری چندمعیاره به‌روش ارزیابی همگذاشت فازی استفاده شد. روش تحلیل سلسله مراتبی برای وزن‌دهی به معیارهای ذهنی شامل معیارهای اجتماعی، محیط ‌زیستی ‌و مدیریتی و مفهوم آنتروپی برای وزن‌دهی به معیارهای عینی شامل معیارهای اقتصادی مورد استفاده قرار گرفت. در این روش با در نظر گرفتن توابع عضویت فازی مثلثی برای مقادیر شاخص‌ها، عدم قطعیت پارامترهای تصمیم‌گیری لحاظ شد. نتایج تحقیق نشان داد برای تصفیه‌خانه شهرک قدس، سیستم آبگیری فیلتر فشاری نواری و فیلتر فشاری نسبت به سایر گزینه‌ها ارجحیت دارند. The design and upgrade of sludge treatment systems generally depend on the decision made regarding the appropriate system from among the options available. The selection process has become increasingly important and complex due to recent technological developments that have led to increased diversity in the available options which offer a wide variety of capabilities. The multi-criteria decision making method is one of the techniques recently developed which takes into account all the criteria involved in the decision making process. The Ghods Town WWTP in the west of Tehran located in the vicinity of residential areas has given rise to claims by citizens due to the odors emitted by the sludge sand drying bed, which justifies the replacement of the present sludge dewatering system. For this purpose, the multi-criteria decision making method based on the fuzzy synthetic evaluation method was used to identify the optimal sludge dewatering system appropriate for the WWTP under consideration. Furthermore, weighting of the subjective (social, environmental, and administrative) criteria was accomplished using the analytical hierarchy process and the objective (i.e., economic) criteria were weighted using the entropy concept. In this method, the triangular fuzzy membership function was also used to take into account the uncertainty associated with each of the decision making parameters. Based on the results obtained, the belt filter press dewatering system and the filter press were identified as the preferred solutions. 1. TurovskiyIzrail S., and Mathai P. K., (2006). Wastewater sludge processing, John Wiley and Sons, Inc., Publication, N.Y.
2. Elimam, A. A., and Dodin, B. (1994). “Optimum selection and operation of sludge dewatering processes.” IIE Transactions, 26, (3), 89-100. 3. Keeny, R. L., and Raiffa, H. (1993). Decision making with multiple objectives, Preference and value tradeoffs, Cambridge University Press, Cambridge, UK. 4. Peniwati, K. (2007). “Criteria for evaluating group decision making method.” Math. Comput. Model, 46 (7-8), 935-947. 5. Koorepazan Dezfuli, A. (2008). Principles of fuzzy set theory and its applications in the modeling of water engineering problems, 2nd Ed., Publishing of Collegiate Jahad Uni. of Amirkabir University, Tehran. (In Persian). 7. 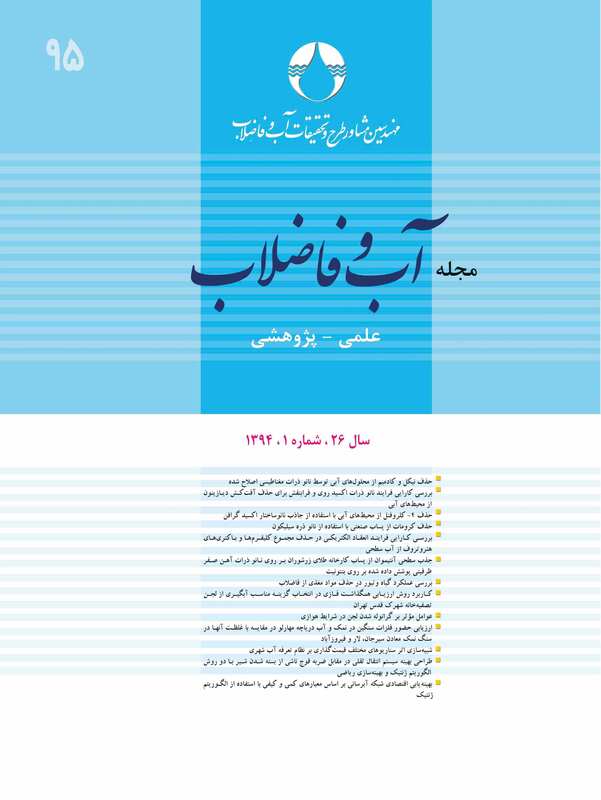 Karimi A. R., Mehrdadi N., Hashemian S. J., Nabi-bidhendi Gh.R., and Tavakkoli, R. (2011). “Using of the fuzzy topsis and fuzzy AHP methods for wastewater treatment process selection.” International J. of Academic Research, 3(1), 737-749. 9. Guangming, Z., Ru, J., Guohe, H., Min, X., and Jianbing, L. (2007). “Optimization of wastewater treatment alternative selection by hierarchy grey relational analysis.” J. of Environmental Management, 82, 250-259. 10. Chowdhury, Sh., and Husain, T. (2006). “Evaluation of drinking water treatment technology: An entropy-based fuzzy application.” J. of Environmental Engineering, 132(10), 1264-1271. 11. Taheriyoun, M., Karamouz, M., and Baghvand, A. (2010). “Development of an entropy- based fuzzy eutrophication index for reservoir water quality evaluation.” Iran. J. Environ. Health. Sci. Eng., 7 (1), 1-14. 12. Lu, R., Lo, L., and Hu, J. (1999). “Analysis of reservoir water quality using fuzzy synthetic evaluation.” Stochastic Environmental Research and Risk Assessment, 13, 327-336. 13. Dahiya, S. (2007).“Analysis of groundwater quality using fuzzy synthetic evaluation.” J. of Hazardous Materials, 147(3), 938-946. 14. Chen, S.J., and Hwang, C.L. (1992). Fuzzy multiple attribute decision-making, Springer-Verlag, New York. 15. Sadiq, R., Husain, T., Veitch, B., and Bose, N. (2004). “Risk-based decision making for drilling waste discharges using a fuzzy synthetic evaluation technique.” Ocean Eng., 31, 1929-1953. 16. Sadiq, R., and Rodriguez, M. J. (2004). “Fuzzy synthetic evaluation of disinfection by-products a risk-based indexing system.” J. of Environmental Management, 73, 1-13. 17. Saaty, T.L. (1980). The analytic hierarchy process: Planning, priority setting, resource allocation, McGraw-Hill, New York. 18. Zeleny, M. (1974). Linear multi-objective programming, Springer-Verlag, Berlin, Heidelberg, New York. 20. WEF and ASCE/EWRI. (2010). Design of municipal wastewater treatment plants, Vol. 3: Solids Processing and Management, WEF manual of practice No. 8, ASCE Manaul No. 76, Mc Graw Hill, New Yourk.